DWF, or Design Web Format, is a file format developed by Autodesk for the distribution of drawing files to anyone who needs to view, review, or print design files. DWF files are highly compressed and are usually smaller and faster to transmit than the original design files. Original design files, for example AutoCAD DWG, may depend on external resources as referenced drawings, plot styles and fonts. The DWF file will contain all information that are needed for displaying the design correctly. You will find more information about the DWF format on Wikipedia. Files in DWF format usually end with a .dwf or a .dwfx extension. 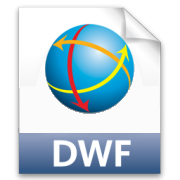 DWFx is the newest version of the DWF file format. DWFx is based on the XML Paper Specification (XPS). DWFx files are typically larger than the corresponding DWF file. All our software products can convert from a wide range of other formats into DWF format. ViewCompanion can view, annotate, print and convert DWF and DWFx 2D files. Both our developer tools, scViewerX and scConverter can open and create DWF and DWFx 2D files.